Delicious and healthy with all the greens – kale, spinach, chard, and seasoned with garlic, scallions, and red bell peppers- you cannot go wrong! So yummy! Heat the oil in a large skillet over medium heat. Add chopped red bell pepper and pinch of salt and sauté for 3 minutes. Add the garlic and red pepper flakes and sauté another 30 seconds. Stir in the kale and another pinch of salt and continue to sauté for 5 minutes. 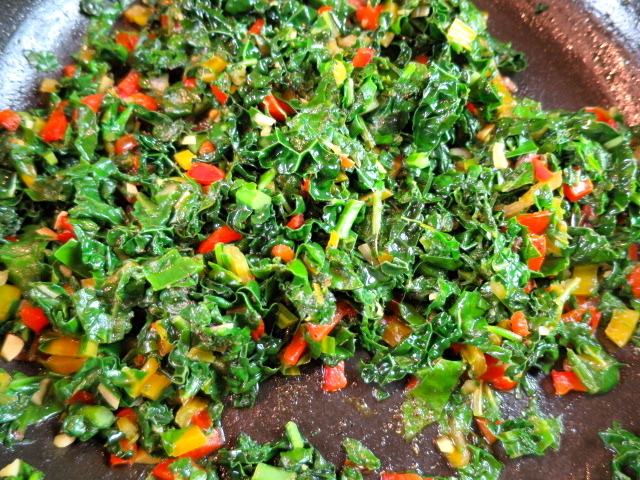 Add the chard and spinach, and one more pinch of salt, sautéing until the greens are wilted and tender, about 5 minutes more. Remove from heat and add a few gratings of nutmeg. Stir to combine. 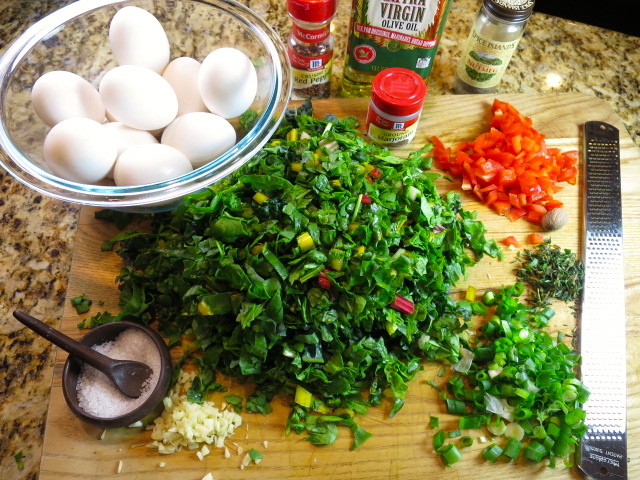 Lay the cooked greens in the bottom of the prepared dish. Set aside. 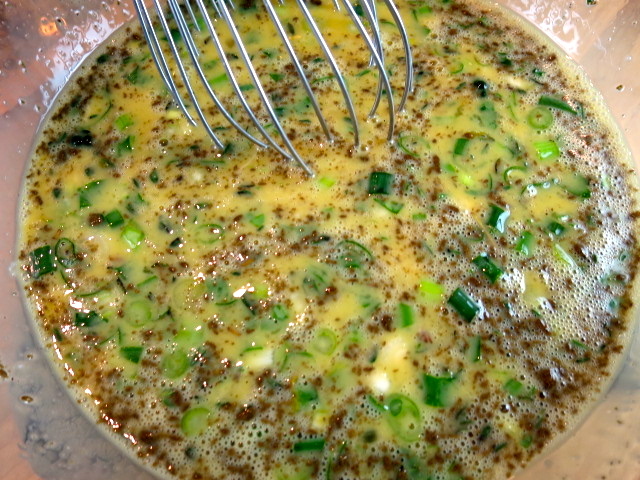 In a separate bowl whisk eggs, scallion, marjoram, thyme, 1/2 teaspoon of salt, and pepper together. 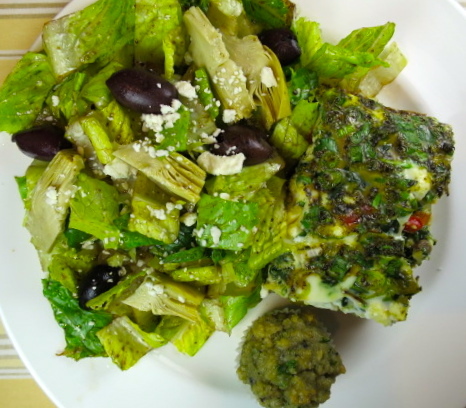 Sprinkle and evenly spread feta cheese on top of greens. Pour egg mixture over all and bake until the eggs are just set, 25 – 30 minutes. 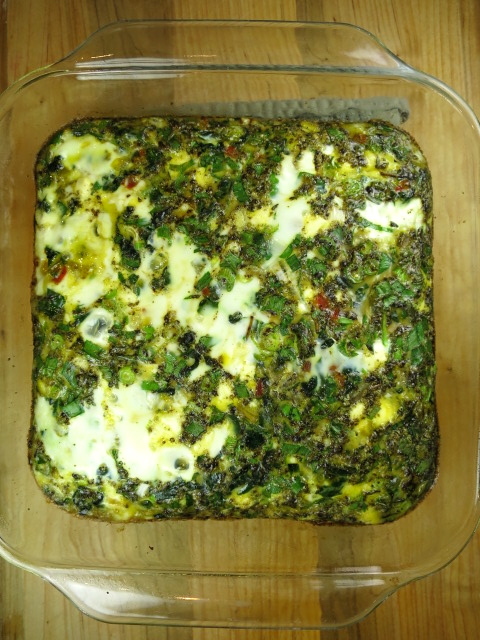 Yes, I served this frittata with a greek salad and savory mini muffins. A whole plate of green and a plethora of scrumptious. 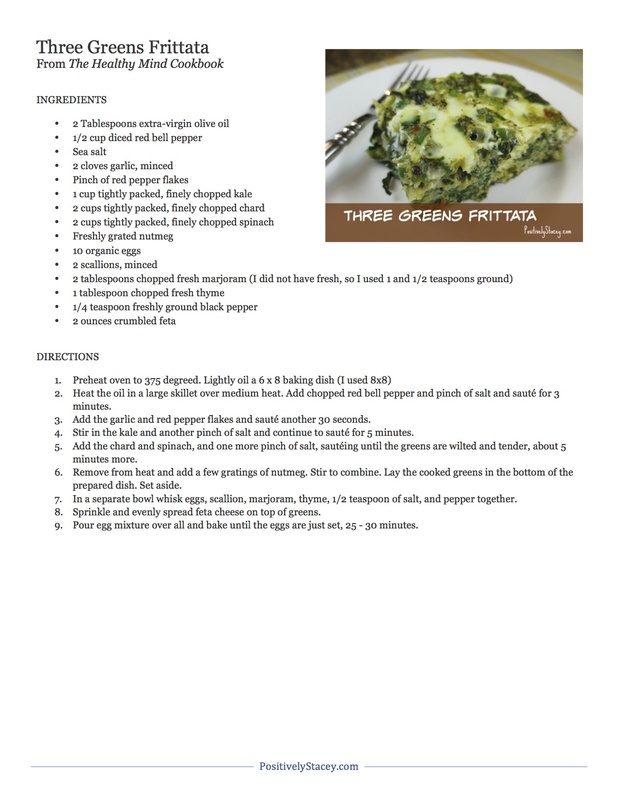 Yes, I love this recipe so much that even after making it three times in a two week span, I am looking forward to making it again soon. 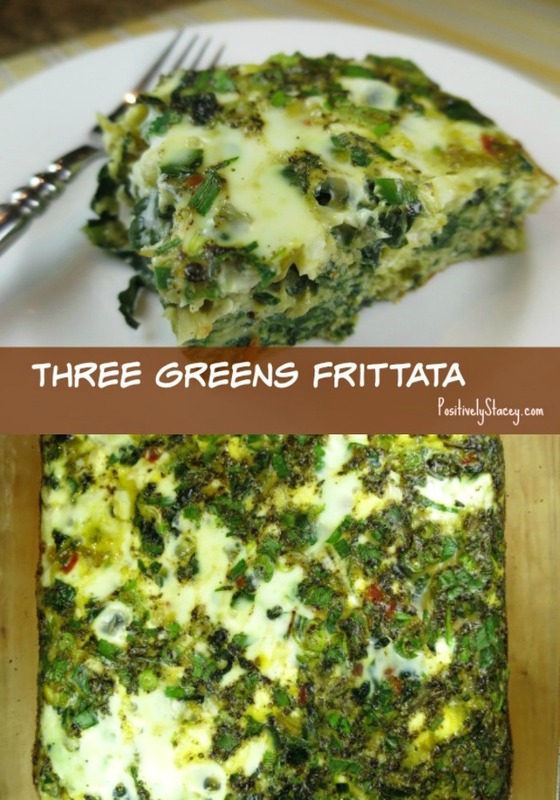 This is a perfect recipe for so many meals – breakfast, brunch, lunch, or dinner. You can serve it warm, room temperature, or cold. 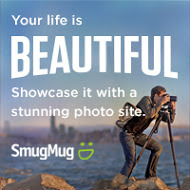 Really – straight from the fridge. 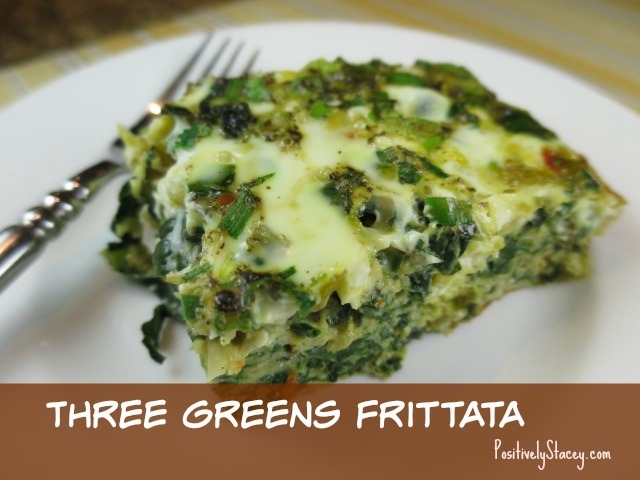 For sure, if you like delicious that is also healthy – be sure to try out this recipe!